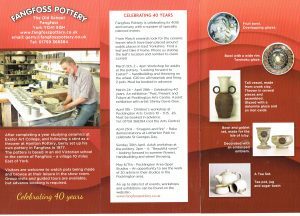 2017 -Celebrating 40 years as potters. 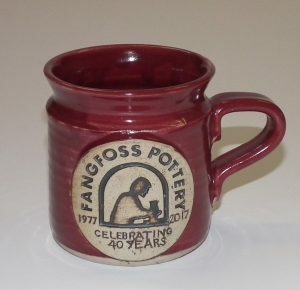 This year we celebrated 40 years at Fangfoss by holding a number of events, mostly free, to thank the community for their support we have received over those years. Our stall in York down Parliament street. Produced a “ceramic poppy garden” with the children of Pocklington Junior School. Made a floor mosaic to celebrate 50 years of the school at Bugthorpe. 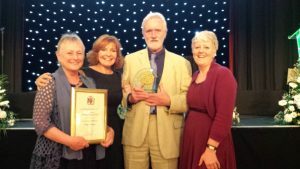 Win the “public vote” for the competition at Potfest – a planted form. Asked for help in the theatre production on Ghost – publicity and the use of the wheel. Make a communion set for the Archbishop of York. Worked with The Northern Potters Association to make a ceramic “wedding breakfast” in Museum Gardens. Worked with York City Council to produce a floor plaque to show at the route of the City Walls in Museum Gardens. 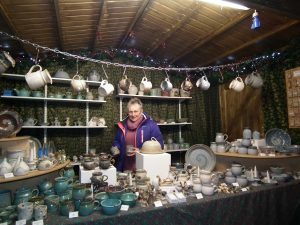 Articles about Gerry appeared in magazines – Living North, The Journal and Craft and Design Magazine.